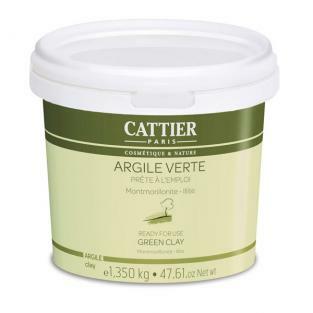 Cattier Ready for Use Green Clay is used in facial masks and for poultices. Absorbent, purifying and regenerating, Cattier green clay is especially well-suited to the care of combination to oily skins. *For a facial mask: Apply the clay paste in a thick coat over the face and neck, avoiding the eye and lip areas. Leave on for approximately 10 minutes without allowing the mask to dry on the skin. Rinse off with tepid water and dry the skin with a cotton towel. Complete the treatment by applying a moisturising cream. *As a poultice: Place the clay paste on a piece of natural fibre and, using a non-metallic spatula, spread it out to a thickness of 2-3 centimetres. Lay the poultice with the clay directly in contact with the skin and hold it in place with a bandage, but not too tightly. If the poultice needs to be applied to an irritated area, lay some fine gauze between the clay and skin. When it comes to taking it off, remove as much of the clay as possible, wetting it if necessary, then rinse off with tepid water and dry with a cotton towel.